The Joint Admissions and Matriculation Board, JAMB UTME Monitoring Groups has published the codes for examination malpractice and their interpretations as well as examination prohibited items in the forthcoming mock examinations and 2019 Unified Tertiary Matriculation Examination (UTME). Please find below the codes for examination malpractice and their interpretations as well as examination prohibited items. 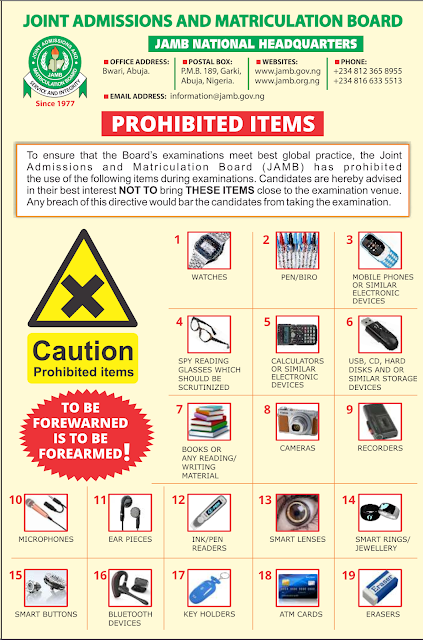 To ensure that the Board’s examinations meet best global practice, the Joint Admissions and Matriculation Board (JAMB) has prohibited the use of the following items during examinations. Candidates are hereby advised in their best interest NOT TO bring THESE ITEMS close to the examination venue. Any breach of this directive would bar the candidates from taking the examination. OTHER ITEMS SUCH AS FACE CAP, WRIST BAND, ETC ARE ALSO PROHIBITED. The Civil Society Group is one of the groups inaugurated by JAMB Registrar, Prof. Is-haq Oloyede, to assist in monitoring the UTME 2019. 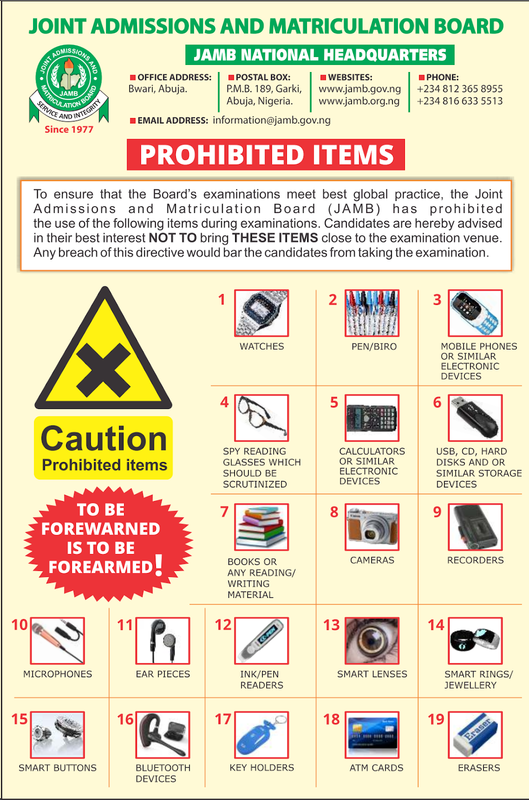 JAMB UTME Monitoring Groups, examination officials are allowed to scrutinise eye glasses or similar devices and where convinced that such item may compromise the sanctity of the examination, the examination official should confiscate it. Where examination official (board staff or ad hoc staff) or any authorized person is found with any of these prohibited items in the examination hall, such compromising action would be treated as a deliberate act of examination sabotage and necessary sanction will be applied.